Pre-applications are being accepted for the new Central Illinois Solar Workforce Pipeline Training Program. The attached application must be completed and sent to either Peoria Jobs Partnership or Tri-County Urban League for initial screening and review. Addresses, websites and phone numbers are listed on the application. Those interested may download and complete the pre-application. 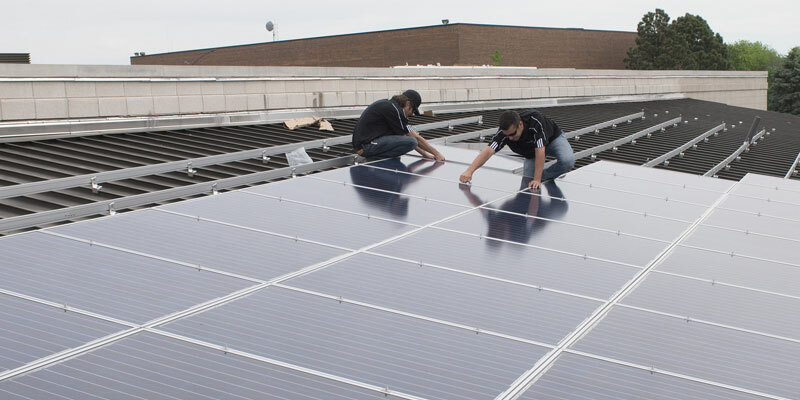 Thanks to a $1 million grant from Commonwealth Edison (ComEd), ICC, along with more than 15 community organizations and businesses, will offer the program, which is designed to build a workforce training program for solar technicians. ICC will serve as fiscal and lead agent for the program, with Illinois People’s Action/Heaven’s View Community Development Corp. and Tri-County Urban League acting as key partners. Beginning in Spring 2018, ICC will begin training for approximately 120 students (30 students annually) over the four-year life of the grant. After assessment, screening, and orientation, students who are admitted into the program will begin four weeks of soft skills and job readiness instruction and then will progress to five weeks of comprehensive solar technical training. This training also includes more than 58 hours of work-based learning opportunities at partnering businesses. Participants receive a weekly stipend of $10/hour while enrolled in the technical training component. Ex-offenders (returning citizens), and former foster youth are encouraged to pre-apply. Applicants must be 18 years of age with a high school diploma or equivalent. Visit the College News article for further details. For questions, call ICC at (309) 694-5-ICC.